H4 Work Authorization, Work Permit or H4 EAD and H4 Visa Issues: Do not Omit H4 Change of Status when doing the H1B transfer. Do not Omit H4 Change of Status when doing the H1B transfer. It is not uncommon that many will omit doing the change of status H4 form I-539 when doing the H1B transfer, this can actually cause some major issues. 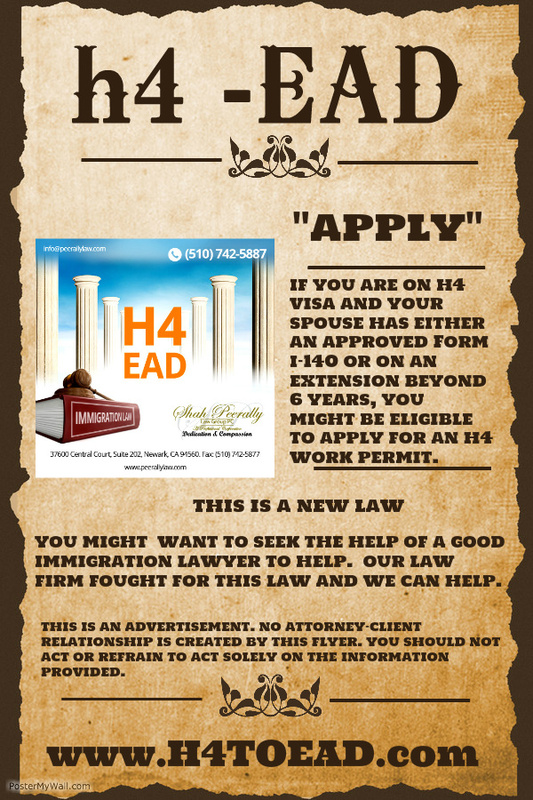 We recommend that you make sure your attorney or company is actually filing for the H4 spouse. You should also file the EAD simultaneously if your H4 spouse is actually eligible for the H4 work authorization document. Failure to file the extension on H4 during the transfer might put your wife or husband out of status, and if H4 is out of status for more than 180 days, you might have an issue to reset back to status. If you or your attorney omitted to file the H4 form I-539 while filing the transfer and has not filed the EAD, please call us at (510) 742 5887. When can the I-140 EAD become a reality? Is the H4 EAD a status? Got a RFE? Don't Freak Out!